DLS Series Vertical Ring High Gradient Magnetic Separator is my company self-developed new type of magnetic separator according to the domestic and foreign characteristics of magnetic separator magnetic. The series is the best performance at home and abroad, the most technologically advanced equipment Magnetic Separator. It used to ring vertical rotation, recoil concentrate with a high-frequency vibration body, a fundamental solution to the flat ring Magnetic Separator peace high gradient magnetic separator magnetic media prone to clogging of the world technology problems. It has a concentration ratio of the ore particle size, concentration and quality fluctuations adaptable, reliable, convenient operation and maintenance. 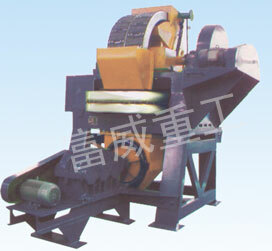 It weak magnetic ore separator has a high concentrate grade and recovery of the double-high high-advantages. Weak magnetic beneficiation of minerals for example hematite, limonite, siderite, ilmenite, wolframite, red mud. Non-metallic minerals, iron remove, purification For example: quartz, feldspar, fluorite, spodumene, kaolin, etc.